Weight : 0.550 grams approx. Material Used : Leather, Brass, etc. The keychain is made of high quality metal. Strong and Durable quality Ideal for home use, car keys, cupboards, novelty collection and gifting. Assorted Colors. 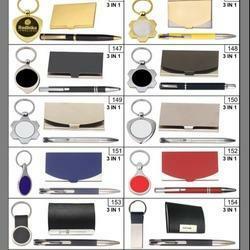 We are offering Pen and Keychain Set to our client. Keep Jewellery Away From Direct Heat, Water, Perfumes, Deodorants And Other Strong Chemicals As They May React With The Metal Or Plating. Wipe Jewellery Gently With Chamois Cloth Or Leather Swatch After Every Use. Keeping in mind diverse requirements of our clients we are into manufacturing, supplying and trading an exclusive collection of Keychain Sets. 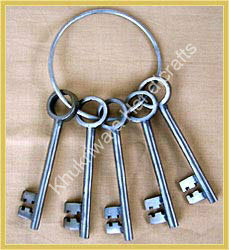 These Metal Keychain sets can be availed by us to meet the ever-changing demands of our clients. These Metal Keychain are crafted using premium quality raw materials to make sure that they offer long service life, attractive designs and fancy look. Metal Keychain with Swasthika (Hindu Symbol).